The Royal 50 family consists of three generations that were produced from 1960 through 1963. 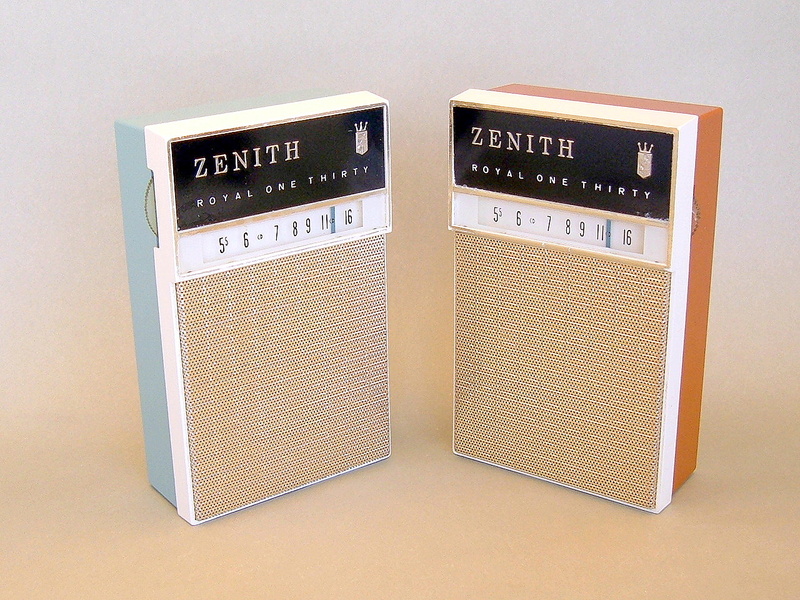 They represented Zenith’s entry into the smaller 6 transistor shirt pocket sized radios and was their answer to the sets coming out of Japan like the Sony TR610 and the Hitachi 666 both of which started in 1958. The Royal 50’s offered great sound quality for their size and were built with high quality componets that allowed them to stand up to years of use and produce 80 milliwatts of undistorted sound. They are powered by 2 AA batteries and measure 4.25″ tall, 2.5″ wide, and 1.25″ deep and weight only 8 ounces. The Royal 50 – Zenith’s First Shirt Pocket sized transistor – Introduced in 1960 This produced tone quality unlike other similar sized shirt pocket radios. The Royal 50H – Introduced in 1961 and followed by a very similar looking Royal 50K in 1962. These were just like the first Royal 50 except for the added metal trim which added to their handsome appearance. The Royal 50L – Introduced in 1962 featured a recessed and protected tuning dial so the stations would not change when placed in your pocket. Because of their styling and performance, Royal 50’s remain a popular choice of collectors today. However, with the increasing competition from overseas and the constant introduction of new pocket-sized radios, this series had a much shorter production run than it’s big brother the Royal 500. The Royal 59 – The family continued into 1965 with the introduction of the Royal 59. A similar sized set, this one had 8 transistors and packed a punch. It’s beautiful grill and smart circular dial make it quite attractive as well. During the early 1960’s, Zenith continued to produce some other styles of shirt pocket sized transistors that were manufactured in the USA up until around 1965-66. The Royal 20 – This Micro-sized 8 transistor was introduced in 1966 to compete with the Standard Micronic Ruby. The Royal 130 – 1965 8 transistor with slide-rule tuning. The Royal 185 – 1965 8 transistor with slide-rule tuning. The Royal 90 – Introduced in 1963, this scarce model was offered in orange. Check out these other Shirt Pocket sized Zeniths radios. Is the black Royal 50K for sale? is it worth anything? how much? A while back, I picked up a Zenith royal R26Y #1223177 at a yard sale. It is MIB and am curious as to its age. I have looked but haven’t been able to find the model year. I would appreciate any info on it.